this story however had it all, it had the action that keeps us coming back week after week, as well as character development and story that seems to have lasting changes. Then to top the great story off the Artwork was top notch, among the best work I recall seeing Jack Kirby do. as I already hinted in the introduction, the story is great, and down right amazing. 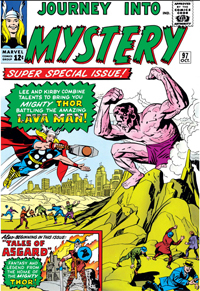 Stan Lee and Jack Kirby where at the top of their game with this issue, and I think they knew it by the words on the cover. Most of the best elements of the story offered rich character development for Thor and Jane Foster. but there was sufficient action too with Lava Man, a threat worthy of the pages of the magazine. the art though the whole story was nothing but top-notch, with at least one larger panel on each page to really showcase the detail. the normal size panels however had no lack of detail themselves. the pacing of the art for the whole story was great, the pacing of the fight scene seemed to show enough quick paced detail and ongoing action , making it easy to follow, while the character development scenes focused in showing the best possible details. the shadows and depth where outstanding in this issue, and the inking job by Don Heck was amazing. the work of this issue of Thor knocked my sox off and is the kind that raises the bar. To say that I consider this the weakest aspect of this story would be true, but then to say that I feel it was still sufficient and above average would be just as true. In fact the continuity was almost as exceptional as the rest, building upon what Odin had told Thor in an earlier issue, and that being part of what keeps him from being with the woman, a mortal that he loves. This story has lots of development as it strains the relationship of Don Blake and his Nurse Jane Foster. Right up to the suspenseful ending that leaves you hanging for restitution in the next issue. While I would not call it a two parter directly, it is an aspect that does seek that future resolution. Odin also gets some development even if we do only see him for a short time. We learn that he has issues with his son being with a mortal. Making Jane Foster a forbidden love that he has to hold the flame for. Will Thor break down and disobey his father? can he convince Odin to allow it? What of Jane Foster being fed up and leaving? this is great development and a great way to be sure to make people like me read the next issue.